What is your English level? Check now – it's fast! *Find out your vocabulary and grammar level: Beginner, Elementary, Intermediate, Advanced. * Full test: find out your overall English level. * Full report: Get a detailed level description. Learn your predicted TOEIC, TOEFL and IELTS scores, as well as your U.S. grade school reading level. *Check your reading, writing, grammar or vocabulary levels separately. 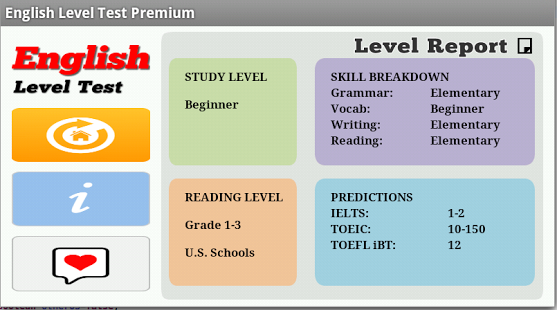 *English learners – Get a rough idea of your English level without spending a lot of money on expensive exams. *English teachers and school administrators – Quickly and easily check your students' English levels. *Business managers – assess your employees' English level. Special low price. Buy now! 1. How does the test work? This is a diagnostic test. The test starts with a beginner question. Every time the test taker gets an answer correct, they proceed to a higher level. However, if the test taker gets a question wrong, they drop one level. This process continues until an assessment of the test takers ability level is made. 2. How accurate are the tests? Our app is designed to give you a quick and approximate idea of your level. All questions have been written by expert teachers. The reading passages were analyzed using special software that tests for word difficulty and sentence length. 3. What about listening and speaking? We are currently working on a listening test. For speaking, due to the current limits of technology, it's best to seek out a certified oral proficiency tester. For example, take an IELTS test or the Standard Speaking Test (SST). 4. How can I improve my test scores? The best way is to immerse yourself in the language. Read and listen to interesting topics at your level, and try to find another student or native speaker to practice with. If you're studying for a specific exam, then it's important to take practice tests and learn test-taking strategies. Also, use your time efficiently. Practice with your mobile device when you're waiting in lines or commuting by public transportation. Our apps are perfect for this. Check out: English Grammar Quiz Game, Practical English and Pronunciation Checker. This is EFL/ESL Language Learning Software.